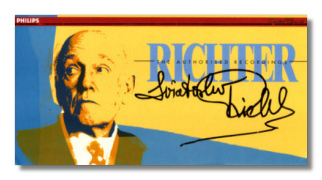 Classical Net Review - Sviatoslav Richter - "The Authorized Recordings" & "Richter in Prague"
Sviatoslav Richter was reported upset over a poster that advertised him as "the greatest pianist in the world," claiming that "I cannot live up to such a legend, I'm just a normal human being who plays the piano." Tell that to the pianists who regularly pack his concerts, Revered as he is, the eighty year old pianist goes out of his way to avoid the limelight. He shuns large halls and big cities, and prefers instead to roam the back roads of Europe and Russia, with piano in tow, like a musical Johnny Appleseed. Along the way he gives recitals in village churches, monastery libraries, or tiny baroque theaters. Richter abhors microphones, and hasn't set foot in a recording studio – or, as he puts it, "the torture chamber" – since 1979. Yet he allows his concerts to be taped. 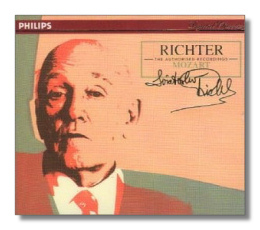 Scores of live Richter CDs, from both official and private sources, flood the market these days. 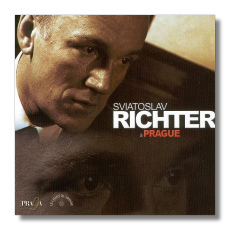 The Czech outfit Praga stands out from the pack, with an ongoing series of unreleased Prague Radio recordings, all taped at Richter's recitals in that city from 1954 to date. Fifteen CDs have come out so far, and more are on the way. 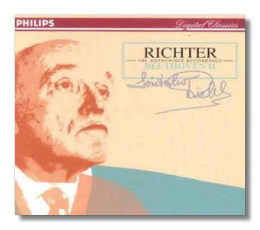 Pride of place, however, goes to Philips' 21-disc box set "Sviatoslav Richter – The Authorized Recordings. ", possibly the largest Richter collection to be gathered under one roof. Ninety per cent of the box consists of previously unissued live material. One wonders, though, why little in the way of complete recording information was provided, given the set's "official" imprimatur. Not everything is "DDD", as marked, indeed some of the recordings date back to the sixties. But the music is our primary concern here, and each disc fully testifies to the Russian pianist's eclectic repertoire, prodigious technical and recreative gifts, sheer physical power, inquisitive mind, uncommon sensitivity, and, above all, individuality. Great pianists usually have one or two facets that dominate their performances in ways that beget adjectives: Horowitzian thunder, Gouldian staccato, Serkin-like nervous energy, Hofmannesque inner-voices, Cortotish rubato. Yet what makes Sviatoslav Richter's playing "Richterian" is not so easy to pin down. The recordings display a multitude of Richters at work. He can be delicate or brusque, withdrawn or optimistic, scrupulous or cavalier, an architect or a miniaturist, a poet or a pedant. One consistent attribute is the pianist's distinctive tone. The beauty and clarity of his sound shimmers with prismatic transparency at all dynamic levels. Chords are always translucent and well balanced. 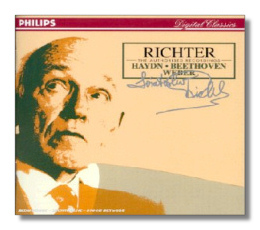 Few pianists can summon the concentration and control that enable Richter, with his hypnotic legato, not only to sustain the unusually slow pace of the Sarabande of Bach's Third English Suite, or the First Movement of the Schubert G Major Sonata, D.894, but also to draw the listener into his sound world. 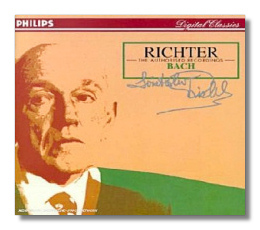 Richter's Bach has become more humane and involved over the years. One does not go to this pianist expecting the last word in Baroque style and ornamentation, yet the sarabandes of the English and French suites are mesmerizing in their breathless calm, and so is the fugue of the early D minor Toccata. Equally impressive is the grand design and emotional breadth brought to the Overture in the French Style. Listeners have the opportunity to compare Richter's unbridled, pianistically oriented 1959-60 Beethoven performances of the Op. 10, #3, Op. 26, and Op. 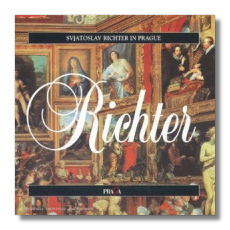 57 sonatas (Praga) to his more stylish and patiently detailed interpretations of recent years. Standing out are the radiant and eloquent last three sonatas, a "Funeral March" sonata (Op. 26) that puts all other Richter versions in the shade, and a magnificent "Archduke" trio. But why was the long repeat in the latter's Scherzo, present on a video filmed at this performance, edited out here? The rarely heard Weber 3rd Sonata, as well as four short Brahms pieces and the Prokofieff 6th (Locarno, 1966) were issued on the Italian Ermitage label, but Philips' superior transfer, taken from an unreleased DG mastertape, provides more color and heft. Conversely, the ultra-clear sonics of the Liszt Sonata make Richter's tersely organized, ongoing conception seem a bit claustrophobic, compared to the more spacious, and rhythmically better controlled (e.g., the dotted half notes in the famous octave passage) 1965 Carnegie Hall performance, once issued by Philips on a short lived "Legendary Masters" CD. Still, this 1966 Livorno reading is one of the great Liszt sonatas on record. Along with the Sonata, pianophiles will want the Chopin/Liszt volume for the pianist's sensational traversal of selected Chopin Études and Liszt Transcendental Études. Richter may not zoom through "Feux Follets" at 73 like he did at 40, yet he digs deeper into these works with more power and heroic sweep than pianists half his age can muster. 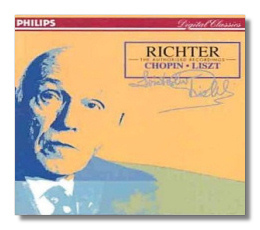 These performances, incidentally, were pieced together using the best "takes" from the Richter's 1988 German tour, but the Praga Chopin Études show that the pianist can manage just as well "unspliced." Some might prefer a less hectic, more patrician Chopin Barcarolle (Ferrara, 1966) but the C# minor and C minor Polonaises (Nijmegen, Holland, 1992) beguile with a brooding, Paderewskian grandeur. The Brahms Paganini Variations, from a 1988 Tours Grange de Meslay recital, have wonderful moments, but the close miking makes Richter's occasionally labored execution sound uncharacteristically bangy. Similarly, the composer's youthful first and second sonatas, taped at the same concert, are heard to better sonic and pianistic advantage on London 436457-2 (Mantova, 1987). But three of Schumann's rarely heard Paganini caprices (Copenhagen 1986) are easily tossed off, and a group of short Brahms piano pieces (Locarno, 1966) shine with strength and cogency. The Schumann Fantasy (Leverkusen, 1979) has more shape and purpose than Richter's overly genteel EMI studio version; neither matches the 1959 Prague performance, though, for rhythmic incisiveness and poetic ardor. Also played on the Leverkusen recital was Schubert's C Major Sonata D. 840. As in his 1961 recording, Richter presents the unfinished third and fourth movements hanging in mid air as the composer left them. The first movements of this sonata, the lyrical G Major Sonata, D. 894 (London, March 1989) and the great Bb Op. Posthumous (Prague 1972) are all stretched out to epic proportions that would crumble instantly under anyone else's hands. The more intimately scaled B Major sonata D. 666 (Florence, 1966) is impetuous yet immaculately controlled, as is the pianist's exciting, yet fiercely objective traversal of the D Major D.850 from Prague in 1954. It is sometimes forgotten that Serge Prokofieff entrusted the premiers of his seventh and ninth sonatas to Richter. The pianist's way with Prokofieff differs from those who habitually hammer away at the notes like manic typesetters. 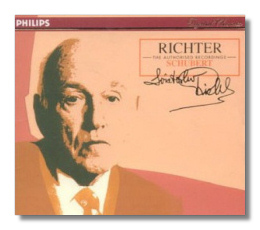 Richter instead imbues the music with a lyrical decorum that stresses its classicism and formal economy. Moreover, he points up the frequently overlooked pianistic beauty behind the notes. Richter also championed Shostakovich's twenty four Préludes and Fugues when they were hot off the press. The six he recorded in a Paris studio for Philips in 1963 have a clarity and penetration few pianists have matched. The same can be said for the Scriabin works in the Philips set, and the mind-blowing 1972 performances of the 2nd and 5th Sonatas on Praga. Out of this vast library of Richterania, I find myself returning time and again to the pianist's Mozart and Haydn. Richter matches the clarity and elegance of this music with playing of jewel-like refinement – always vibrant, luminescent, and singing. The music unfolds with such naturalness and inevitability, that one imagines the piano is playing itself. Drawing from aircheck sources, Praga's sound ranges from grainy mono to excellent stereo, with occasional wow and flutter. My recommendation leans towards Philips for their superior engineering, yet Praga provides musical experiences I wouldn't want to be without: exquisite Ravel, a more flowing Beethoven Op. 101 than on Philips – together with monumental readings of the Hammerklavier and Diabelli Variations, and peerless Rachmaninoff and Mussorgsky. Philips offers a tantalizing bonus CD with 64 more minutes worth of unreleased Richter gems, and a picture book documenting Richter's annual festival at Tours Grange de Meslay – only to those who spring for the big box. If all this still cannot sate the most devout Richter nut, BMG have brought out two discs from the 1988 Schleswig-Holstein Musik Festival. Six Chopin Études from Op. 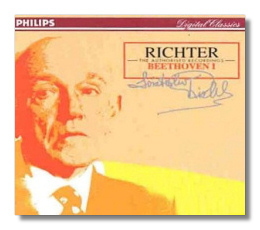 10, a tad more cautious than the Philips versions, are coupled with a statuesque and slow motion Beethoven First Concerto (RCA/BMG 61534-2). 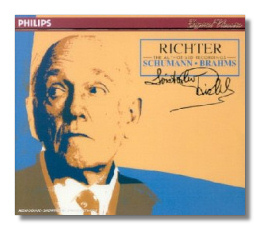 The other disc (BMG 60859-2) boasts Richter's best performance of the Brahms C Major Sonata, and equally marvelous ones of Liszt's Sixth Consolation, 17th Rhapsody, Harmonies du Soir, and a roaring Scherzo and March. 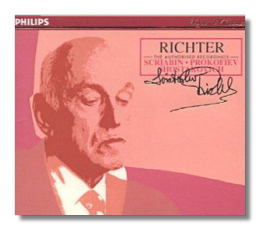 For dates and locations otherwise not provided with Philips' booklets, I referred to Richter discographer Falk Schwartz' research, kindly provided by John Berrie, administrator of the British society "Friends of Sviatoslav Richter." Copyright © 1995, 1996, Jed Distler.